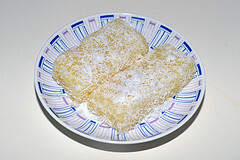 Mashed tapioca cake (Kuih Ubi Kayu) coated with grated coconut shreds. This kuih is especially good for breakfast or afternoon tea. Peel and wash the tapioca and cut into chunks. Steam for at least 25 - 30 mins. to cook. Steaming will “loosen” the tapioca and give you a better mash. Check out these food steamers . Steam until the tapioca are soft enough to be poked with a knife. The knife should pierce the heart of each piece easily without force. Cool the tapioca chunks and break each piece into two, removing the fibres in the centre. Break up roughly with a fork. Add in the brown or red sugar. Mix well and press the mixture into a square, lightly greased baking tin. Allow it to cool completely, then cut into desired shapes. Combine the salt and grated coconut together. Steam the grated coconut on high heat for 5 minutes. This process keeps the coconut fresh longer. Serve Kuih Ubi Kayu with a sprinkle of grated coconut.